Mamounia's allure is its luxuriously elegant décor that let’s you retreat to the far land of Morocco. The restaurant /lounge is spread over two levels. Downstairs is the formal dinning room decorated in crushed velvet pillars, colourful silk cushions, low level seating, with rose petals, candles and aromas of incense creating an exotic and romantic ambience. Upstairs is the lounge bar where you can enjoy sumptuous cocktails before or after your meal. The lounge is decorated with lots of rich colours and plush fabrics with rhythmic music playing in the background. Relax, unwind and follow the Arabic tradition and smoke on a shisha pipe. There are traditional belly dancers accompanied by a Derbakeh player Monday to Sunday. Live Arabic music on Friday, Saturdays and Sundays. There�s live Spanish and Latin music every afternoon at the Lounge area. Mamounia is an Oasis that can cater for all events including private parties, public relations events, pre and post movie premier parties. The main restaurant is located under the lounge area and seats up to 120 guests with two V.I.P rooms, which are inter-connected. The Lounge is located on the ground floor and seats up to 60 people and 20 standing. Exclusive hire is available on request and can accommodate up to 350 people. Morocco is home to one of the world's greatest cuisines and Mamounia will not disappoint. The menu encompasses a whole range of delectable dishes to choose from. Hot and cold starters consist of individual or platter mezze. 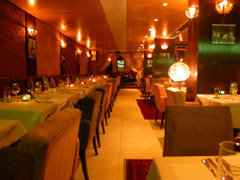 There�s a good selection of Tangines, Couscous and Main courses. The food exudes exotic aromas and full piquant flavours. Good, extensive international wine list. Furrealz? That\'s maoeslruvly good to know.